Many students of politics, media studies, communication, and journalism have often heard the phrase to describe the press: “If it bleeds, it leads (or reads).” The focus on the sensational and action-worthy is characteristic of an American culture infatuated with infotainment, but also the product of the press’ role in society. In many ways, the press is one of the catalysts for change – they find imperfections, wedges, and cracks in an otherwise perfect scene and focus incessantly on these marks. Is it newsworthy to cover the success of a politician or business CEO? Sure, at times. But, it is even more newsworthy to cover a catastrophic failure (Healthcare and Clinton 1993, Katrina and Bush, 2005). The press, as I have said before, is an agenda setter and regardless of whether it is the new or old media, it is imperfections in the environment that leave the press to focus on societal cracks and in the process expose the character of an individual(s) who is fighting the societal machine. The press loves an underdog, in politics, in sports, or in business. There is a reason why the phrase “Cinderella story” is used so often to describe the come from behind victory, the hail mary pass that won the game, or the David and Goliath biblical narrative of a person running against power and privilege. This is news because it is a uniquely American ideal. Stand up to power in the face of incredible odds (America against the British, America against the Nazis/Axis powers) and win. The underdog becomes a mythical figure fighting for what is right and just in an imperfect world. A press underdog is symbolic of the imperfection in a certain environment. This is a pleasant press narrative, isn’t it. The rugged looking Brown who drives a truck against the patrician Coakley who has run her campaign into the ground. It is an interesting narrative in a state that has never elected a woman governor or U.S. Senator (not to mention whose ancestors banished Anne Hutchinson from the Massachusetts Bay colony for being too independent and out spoken). Coakley is not outspoken and when she does speak, she usually ends up putting her foot in her mouth (Curt Schilling as a Yankee – puhlease). Yet, in many ways, it seems that progressive Massachusetts voters may have something to say about female politicians, but that is for another posting or an astute gender studies a nalysis of the press coverage. Suffice it to say that the press has driven the underdog narrative to Brown’s advantage and has allowed the Republican to capitalize on voter discontent over spending and President Obama’s healthcare agenda. Political scientist Darrell West notes that polling effects in election campaigns may lead to an underdog effect (supporting the losing position) until it becomes a winning position and becomes the bandwagon effect (increasing momentum). West (1991) found that these effects were most on display during referenda elections, which lacked party labels as opposed to general election contests such as presidential elections. In other words, people look to the press for vote cues. Diana Mutz (1997) has found that people respond to the mediated views of mass others by re-evaluating their own attitudes in light of new information, something that could be at play in Massachusetts. This could potentially account for any underdog effects and momentum seen on the part of Scott Brown. 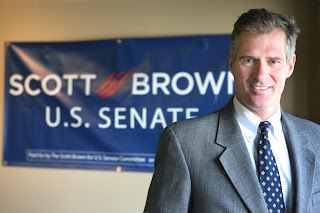 The press continues to drive the underdog narrative, even as it appears that Scott Brown has taken a small but sizable lead in the Democratic state. Jake Tapper reported for ABC News “Coakley A Democratic Canary in a Coal Mine?” while the American Spectator dubbed Brown’s campaign “The Scott Heard Round the World.” In fact, many conservatives have likened Brown’s campaign to the American Revolution and the “shot heard round the world” after the Boston Massacre. While the Boston Globe has called the campaign “Coakley’s Rocky Run,” after positive polling results were reported for Brown, the Boston Herald exclaimed “Great Scott!” after similar results were reported. Even Democrats have begun to privately and publicly attack Coakley’s campaign, a pile on that drives the underdog narrative and only helps Brown. Because special elections are low turnout affairs, they are often ripe for surprises and often closer than the ideological leanings of the electorate represented. In many ways, they may be likened to referenda (in West’s study) in the fact that they are low attention events, often held in condensed time frames, and appeal to different portions of the electorate that would usually vote in more publicized circumstances. In Massachusetts, the cat is out of the bag at this point with robocalls, ads, and GOTV efforts inundating the state. But that doesn’t mean people will show up in January, in Massachusetts, when there are warmer places to be. There are many instances of special elections that often gave hope to the out-party in the district or state. When Congressman Bud Shuster retired in his reliably Republican district in conservative central Pennsylvania (2001), his son running to succeed him was only able to muster 52% of the vote in a district that is almost 60% Republican. In 2005, Democratic candidate and Iraq War veteran Paul Hackett ran in a reliably Republican congressional seat against Jean Schmidt who was a member of the Ohio House of Representatives. She barely won by 3.5%, an early barometer for President Bush’s popularity in battleground states. In a 2007 special election, Democrat Niki Tsongas beat back a strong Republican challenge in a Massachusetts congressional district that backed Senator John Kerry for President with 58%. Tsongas won with 51%. Special elections are different beasts and are often decided by who shows up. But in the court of public opinion, it appears Scott Brown has already won. He has brought the Democrats to their metaphorical knees, with even the president portrayed as running to Massachusetts to “rescue” the Coakley campaign. Ah damsels in distress. The underdog narrative has flipped the polls, as Real Clear Politics polling average illustrates. While I caution against polling aggegrates with different methodologies, it also shows a trend (and a flip) in Brown’s direction. Call it a bandwagon or a fluke. But this is one underdog whose broken leash may make him the top Election Day dog.